So we have finally arrived in Grenada, and are now south of our target latitude (12:06N) which means our insurance is valid even in named storms. 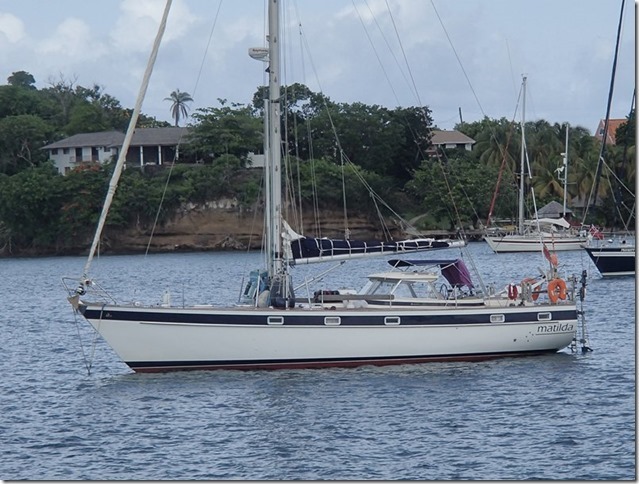 The plan is to spend a couple of weeks in the anchorages at the south end of the island and then move Anastasia into Port Louis marina for a month, while we fly back to the UK for a visit. Currently we are anchored in Prickly Bay, which is one of the more popular bays, despite being a bit rolly. It is the peak of the rainy season here in the tropics, so any anchorages on the lee side of an island are going to have periodic rainstorms. It gets hot and sweaty when you have to close the hatches to keep the rain out. It is a shame there isn’t somewhere like the Tobago Cays down here (protected by reefs but with a strong breeze). We have tried running the air conditioning periodically but that doesn’t really help because if you cool down the interior and then let in air with 95% humidity then everything becomes soaking wet. Andrea is using the idle time to sort through her hoards of sea glass, and some is even being thrown overboard! She is going to the free cruisers Yoga and Tai Chi classes in the mornings. I am spending a lot of time browsing the web, ordering bits and pieces to be collected when we are back in the UK. I went with Marty (True Colors) and Niels and Rowena (Krow) to a West Indies one day international against Bangladesh. Niels wanted to watch from the “party stand” which was fun, but we had to move into the covered stand in the afternoon when the sun got too hot. 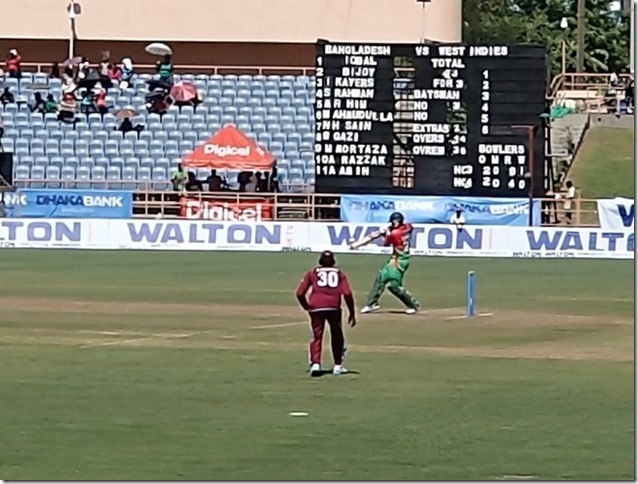 The game was not very exciting because the Bangladesh batting collapsed (all out for 70) but it was an interesting spectacle. A familiar sight next to us in Prickly Bay. Jonathan and Heather’s old yacht, Matilda. 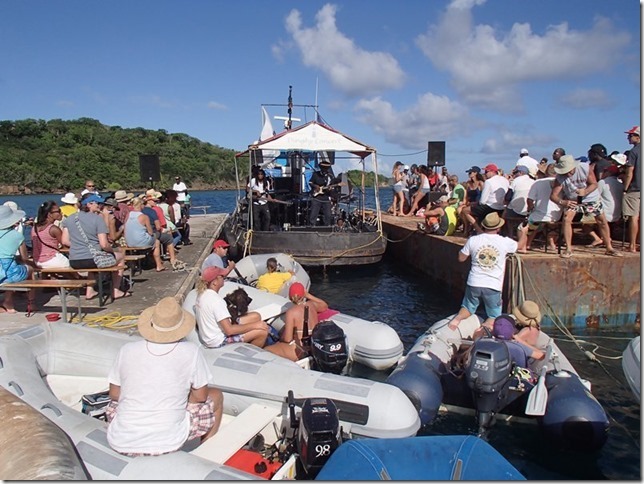 The marinas and chandleries periodically arrange entertainment, like this dinghy concert. 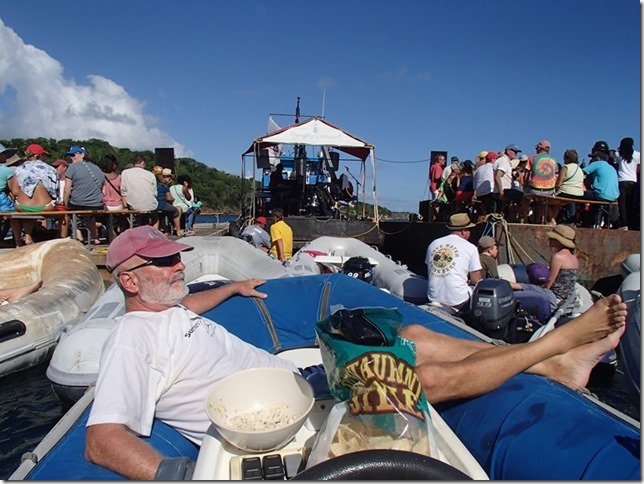 Marty (True Colors) chilling out in our tender. 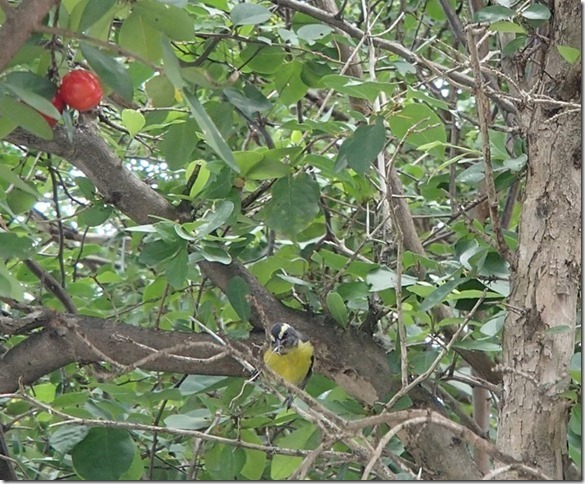 A Bananaquit (the classic yellow bird from the song, just not in a banana tree).